Nine out of ten times, when planning gatherings or meet ups with my friends, I avoid the Orchard area for a variety of reasons but the biggest reason why is the lack of interesting halal eateries. At the risk of sounding ungrateful or obnoxious, aside from the usual suspects i.e. Coffee Bean and Beanstro, Fish and Co, Ayam Penyet Ria, Ramen Ten, the few halal eateries at Far East Plaza or Lucky Plaza, Swensons and Coffee Bean, there really isn’t anything else to eat. 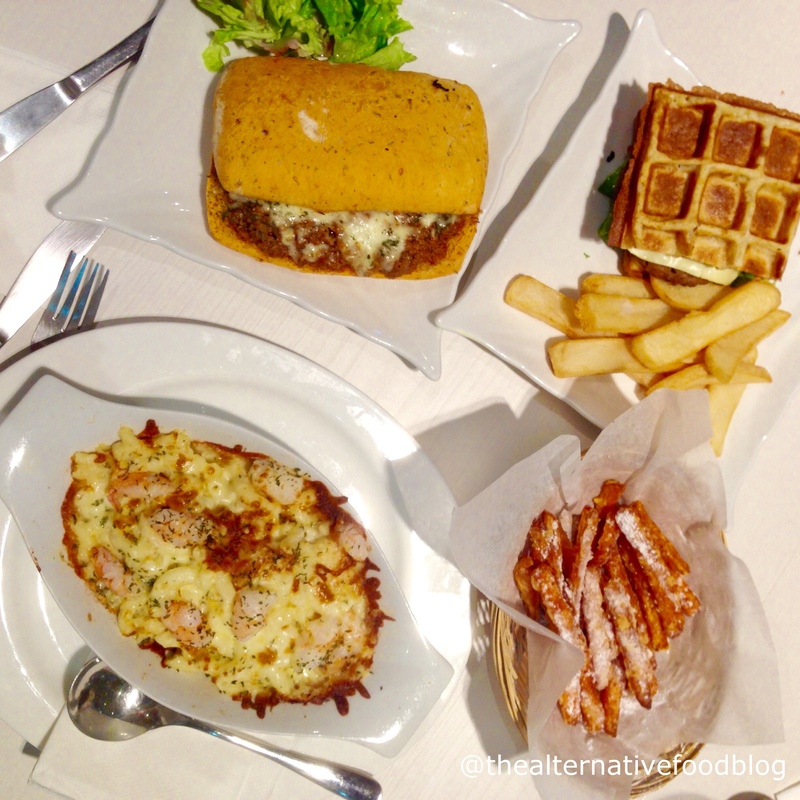 While I do enjoy eating at the abovementioned eateries, it doesn’t hurt to have variety. Thus, the hearing of a newly halal-certified eatery in the heart of Orchard Road was definitely music to my ears. 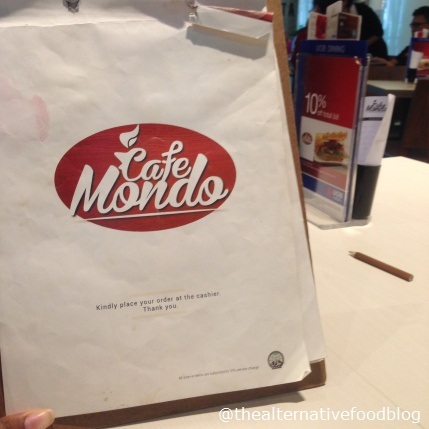 I hit Cafe Mondo with a friend on a Monday afternoon when most other cafes in Singapore are generally closed. Given their location, it is no surprise that they are open on a Monday. Cafe Mondo occupies a decent-sized space in a Orchard Central, which is just a stone’s throw from Somerset MRT Station. You’ll see it the moment you get off the escalator on the second floor; it’s pretty hard to miss. When we arrived at about 2 pm, the cafe was reasonably empty and we did not have trouble getting a place to sit. At first glance, the cafe would probably sit about 20 – 30 people comfortably. It isn’t a very big space so I was glad we weren’t there on a weekend when there would be presumably more people. Like most other cafes, their order system is pretty straightforward: you fill up their order sheet, bring it to the counter and make your payment upon order. Your food is then served to you once it’s ready. Since we were famished, we ordered quite a spread of dishes starting with a serving of their Sweet Potato Fries (SGD $5.50), a Waffle Beef Burger (SGD $14.50), Baked Macaroni & Cheese with Prawn (SGD $11.50), a Foccacia Beef Mondo (SGD $11.80) and we washed it down with a House Iced Sorbet Tea (SGD $6.80) and a Mondo’s Root Beer Float (SGD $7.50). We didn’t have to wait too long for our food, probably because it was past lunch hour, and thankfully most of our dishes were served at the same time so we dug in quite immediately. I’ve always preferred sweet potato fries to normal fries so I was quite excited to try this dish. Our fries came piping hot and crispy, which was a plus for me. Often, sweet potato fries can end up being soft and soggy if they are not battered up properly. However, the one gripe my friend and I had about the fries was the sprinkling of icing sugar on the fries. Sweet potato fries are already sweet and we thought that the dish would have been fine on it’s own or if there was really a need to add a different flavour to the dish, perhaps, some salt would have done the trick. I’ve never had sweet potato fries with sugar so it was a tad too sweet for me. 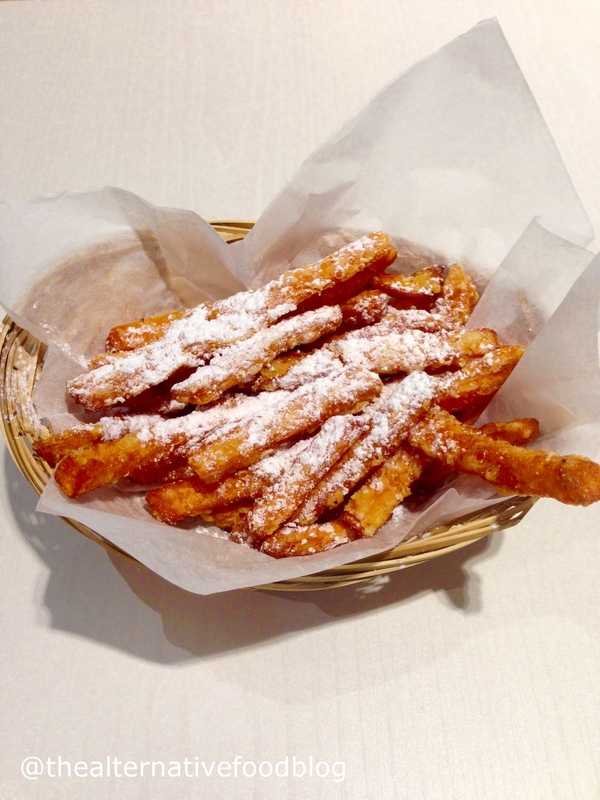 However, without the icing sugar, I thought the fries were great. The next time I do order the dish, I’m going to request that they leave the icing sugar off my order. 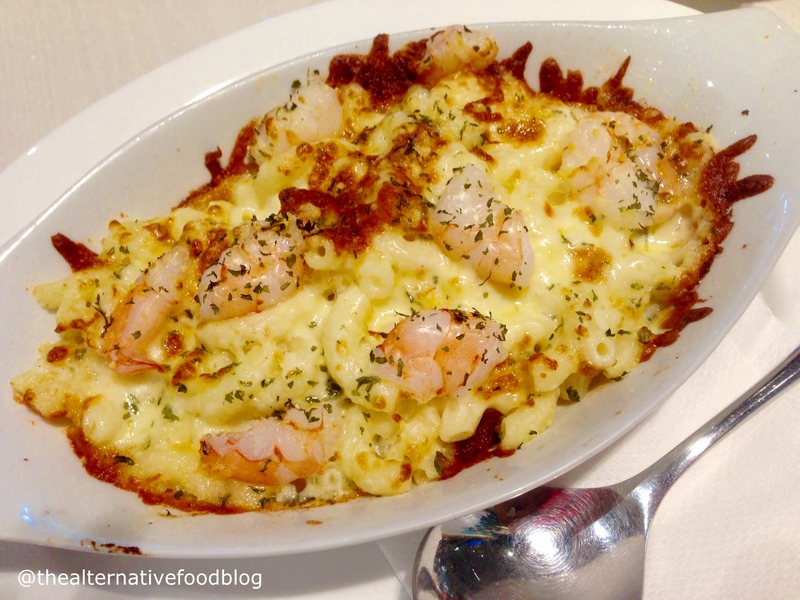 In between bites of sweet potato fries, I tried to enjoy my main – the Baked Macaroni with Prawns. I don’t know if this dish was meant to be like a Mac and Cheese dish or a variation on the baked rice dish but either way, this was my least favourite dish on the menu. It was rather disappointing because I was really hungry and was excited to try this. The dish was basically macaroni and tiger prawns that had been chopped up into smaller pieces, which was cooked in a cream sauce, topped with mozzarella cheese and baked ala a baked rice dish. However, the dish in general lacked seasoning and if it was meant to be a Mac and Cheese dish, then the cheese definitely lacked a certain punch. I was really disappointed with this dish and thankfully, my friend and I had decided to order their house special, the Foccacia Beef Mondo, so I ended up ditching this dish and trying the sandwich instead. The Foccacia Beef Mondo, as its name suggests, is a beef sandwich on foccacia bread. I wasn’t quite sure what to expect when we ordered it, just that it sounded quite interesting what with the combination of beef, their special beef sauce and mozzarella cheese. 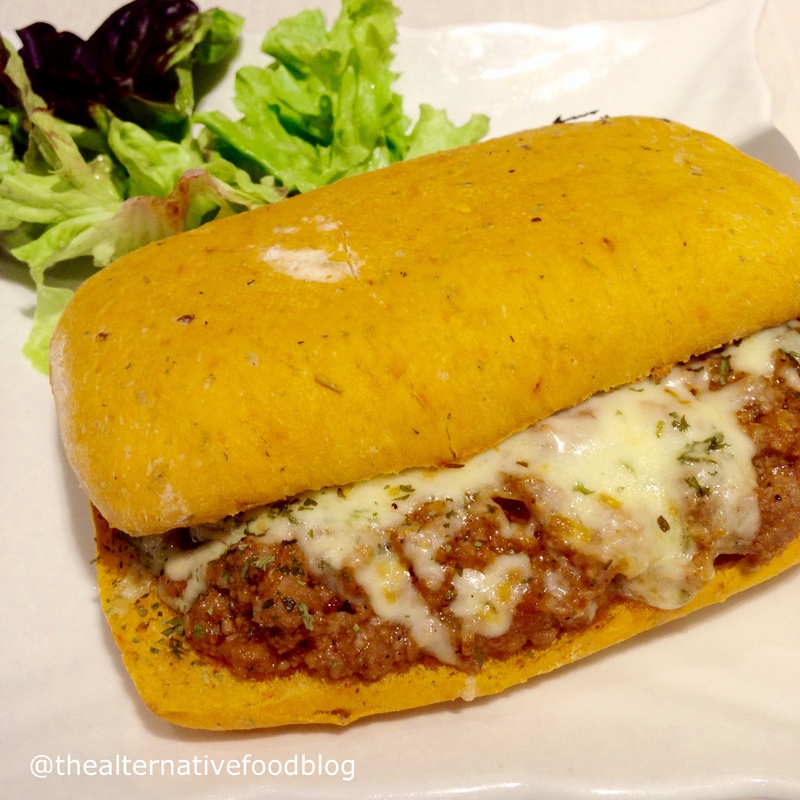 The sandwich, if I had to describe it to someone who had never tried or seen it before, is basically a minced meat sandwich which is cooked in their special sauce (similar to a bolognese sauce) and topped with baked cheese. I quite liked the sandwich, especially in comparison to my earlier dish. It wasn’t as spicy as I thought it would be but since my tolerance for chilli is not very high, I was content with this. I felt that eating this dish was akin to eating a spaghetti bolognese sans the pasta. However, to their credit, the focaccia bread that they used was quite likely to be a Mediterranean variety bread which contained herbs so it added an extra dimension of flavour to the dish. 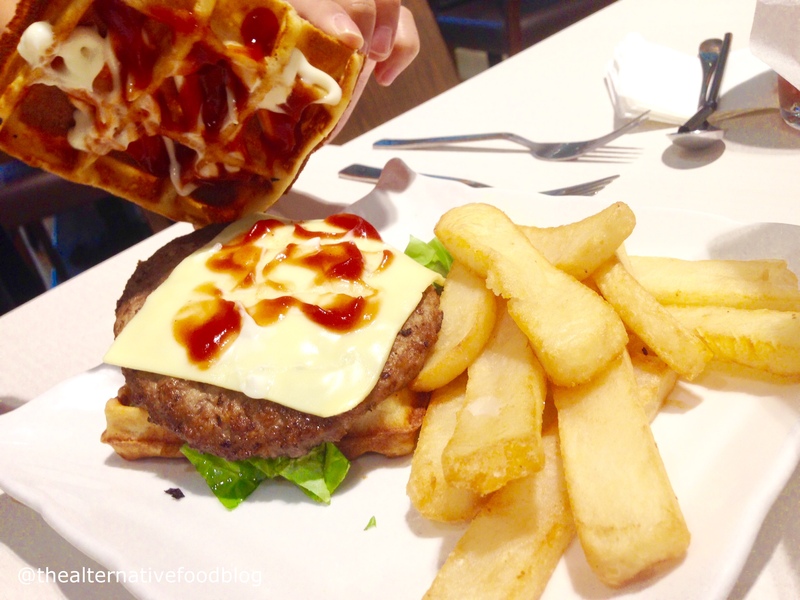 My friend ordered the Waffle Beef Burger because she really likes the idea of savoury waffles. 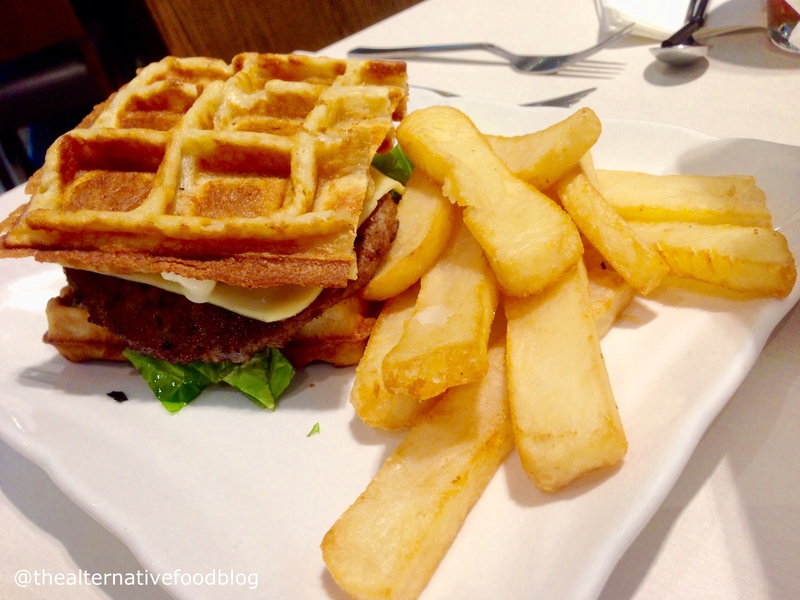 Savoury waffles, or waffle burgers are definitely a more Western concept with more places here serving more sweet waffles than savoury. The burger consisted of two waffle ‘buns’, an Angus beef patty, lettuce, tomato, caramalised onions, cheese and a few sauces put together and it was served with a side of steakhouse fries. In comparison to my main, this was definitely better and had all the elements that a good burger should have but my friend felt was lacking was in the patty itself. 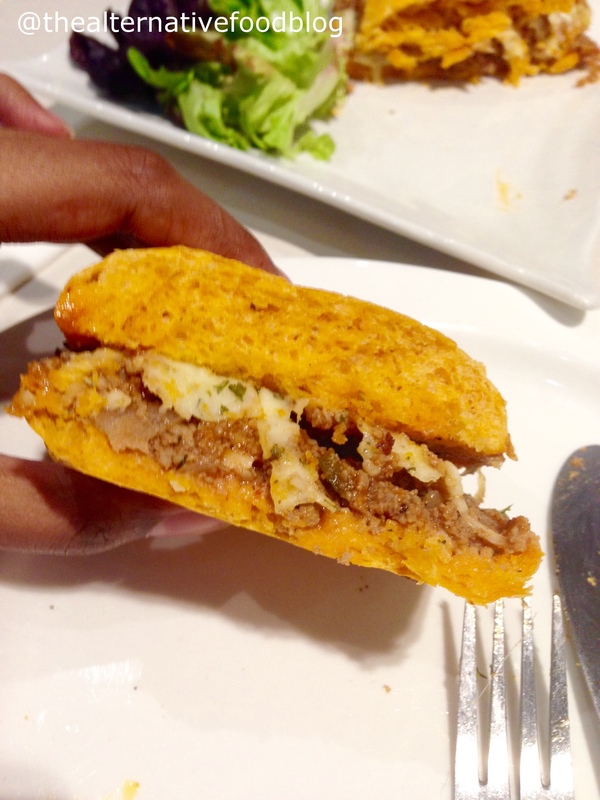 Although the menu said that it was an Angus beef patty, my friend didn’t feel that the patty was all that it was hyped up to be and tasted like any old run of the mill beef burger patty you could pick up at the supermarket and defrost. Sadly, that was the letdown on this dish. Though, to be fair, it was an alright burger but perhaps, a better patty would have taken the dish up a notch. We ended our meal with their House Iced Sorbet Tea and a Mondo’s Root Beer Float. I was initially a little hesitant to pay almost SGD $8 for a root beer float but I realised that their other drinks were equally pricey i.e. 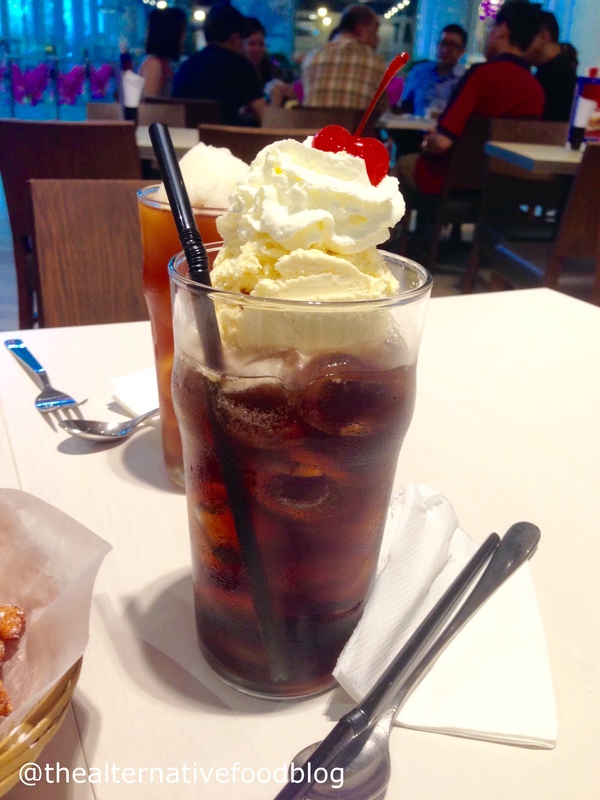 SGD $6.50 for fruit juices and SGD $3 for a can of Coke so I decided to just splurge on a root beer float which was worth my money and it did not disappoint. Refreshing, gassy and definitely what a root beer float should taste like. Likewise, my friend’s house iced sorbet tea was a nice end to her meal – light and refreshing with that added bit of sorbet. Thinking back on my visit there, I don’t think that ‘cafe’ isn’t the word I would use to describe this place for a variety of reasons from the decor to the food options. It seemed more like a bistro than a cafe. However, in Singapore, where the cafe scene is so dynamic and new cafes are constantly popping up one after another, I suppose it is hard to pinpoint an exact cafe identity. 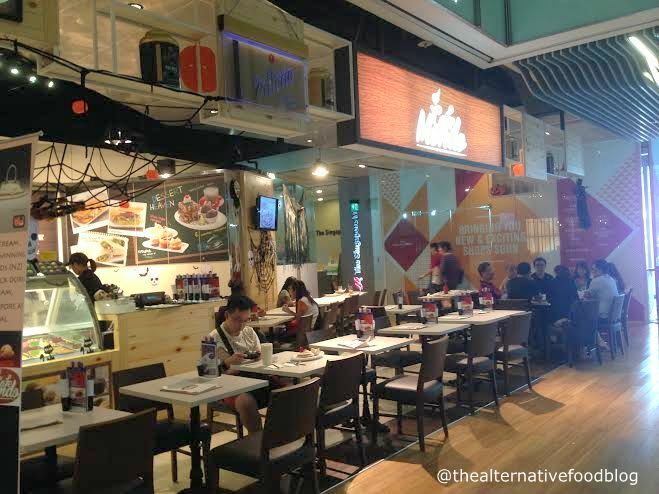 What I appreciated about Cafe Mondo was that it was situated in Orchard Central which is not a popular hang out for most kids, so the ambience is a quiet one which facilitates easy conversation and the service was good. There were some hits and misses with the dishes that we ordered but like I’ve always said, it really depends on personal preference and sometimes even luck. With all that said and done, I am immensely grateful for a new place where I can bring my friends to which offers a plethora of dishes to cater to different dietary requirements (i.e. vegetarians and pescetarians). Till the next time, but perhaps, for a different set of mains. Halal Status: Halal certified eating establishment. Vegetarian Options: Few available for ovo-lacto vegetarians. Our Ratings: ♡ ♡ and a half / ♡ ♡ ♡ ♡ ♡ (2.5 out of 5 hearts).